The Sage 300 version 2019 release has introduced some significant improvements to the product. In this blog article we are going to look at the Global Search functionality and the Inquiry Tool updates now available in Sage 300 version 2019. In the next blog article in this series we will look at the redesigned Sage 300 and Sage CRM integration. The Global Search functionality now allows Sage 300 users to look for transactions, vendors, customers, journal entries etc. across the entire database. 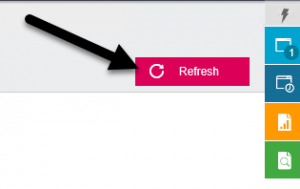 To activate the Global Search functionality in your new 2019 version, hit the refresh button which builds out the Indexing – this can take a few minutes. Once done, type in what you are looking for E.g. : Ronald. You will see all the items related to Ronald. The search results link to the screen that has more in-depth information. Global Search has drill-down functionality and allows you to search for data across the database. The drilldown functionality saves you time because you don’t have to go to each module to look for relevant data. In Sage 300 version 2019 – the technology layers and performance have been enhanced. This release includes the option to install Sage 300c web screens in a web browser. The release includes many new web screens, as well as new features and enhancements to existing web screens. Web screens run in parallel with the classic Sage 300 desktop screens. You can run the Sage 300 web screens inside and outside your network with appropriate web security (e.g. https, web certificates). Sage 300 version 2019 has an HTML5 environment, so it does allow for great web browsing, and has been active since the 2016 version (3rd version with screens in place). Inquiry Tool – This tool now has many more queries available in the Standard queries section. 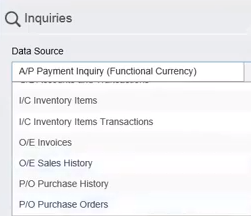 The menu allows you to choose standard inquiries from the AR, AP, IC, OE, GL and PO modules, as well as create your own Custom queries. If we drill down into an Inquiry, you have the option to save the query as well as export the data using the Export button. 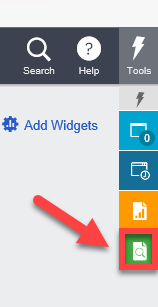 While these are not Sage 300 version 2019 improvements we want to discuss the other tabs under the Tools Feature that are available in Sage 300 Web Screens: Open Screens, Reports and Recently Used Windows. Open Screens – This feature gives you the ability to have more than one screen open at a time. So, you can come in the morning and open several screens – Customers, Inventory Control, Order Entry and easily switch back and forth between the screens throughout the day as needed using the Open Screens window on the right-hand side. Reports – You can easily build a report menu under this Tools feature, to quickly access report links (including custom reports) you use on a frequent basis. Recently Used Windows – You can easily access your system browsing history via this tab under Tools feature. Please note: Sage 300 users will need to be on the Sage 300C version, and pay for the software on a subscription basis to use these features. For more information on Sage 300 version 2019, please contact Front Line Systems via our website or call 866-435-0243. Watch our YouTube video – ‘What’s New in Sage 300 2019?